For those of you not on The Facey Bookie thingie, we here repeat an edited version of the funeral address for Stumpy's Marathon, penned by the Royal Stumpmeister himself and posted on Facebook in July, 2017. Stumpy's Marathon is dead! Long live Stumpy's Marathon! Stumpy’s Marathon has been cancelled for 2017. 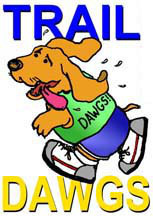 This classic TrailDawg event was held for 15 consecutive years beginning in 2002. It all started in response to a remark around mile 12 of a 16 mile Sunday run: “Hey, you should start a marathon…Yeah, Stump’s Marathon!” Funny how late run lunacy can sound normal sometimes. Stumpy’s grew, shrank, grew again, and is now fading into oblivion. Along the way it was named by Runner’s World as one of the “Coolest Race Medal” marathons (http://www.runnersworld.com/races/the-coolest-race-medals) and by TrailRunner Magazine (online) as one of the three best trail marathons in America (http://trailrunnermag.com/races/hankering-to-hurt.html…). Yes, Stumpy’s became a classic and a signature event of the TrailDawgs. But as George Harrison explained, “All Things Must Pass.” (Including Stumpy’s and George). Traditionally, Stumpy’s has always been held on the first Sunday following Labor Day each year. The chosen date is because I always needed Saturday to mark trail after the first grueling week of school, and because at its inception, there was no other significant event on the running calendar, and mostly because it always falls within a day or so of my birthday, September 9. Sadly, this year I am being forced to take Ellen and Stephen to State College, Pa to attend the Pitt/Penn State football game that weekend. So, no Stumpy’s Marathon. On the other hand, I have absolutely nothing to do on Saturday, September 16. And given that in 15 years, I only had the opportunity to run the full distance twice (I won both years. The first time by coming in around 50th and the second time by coming in around 15th. The RD decides the winning criteria.) Thus, with nothing else to do and jonse-ing for another Stumpy’s completion, I am planning to run the full Stumpy’s course. I will be starting my quest for a third completion at 1:00 PM, Saturday, September 16, 2017 from my house. There will be water at various places on the course, because I am planning to drop a few jugs in the weeds at various locations. Others who care to join me may drop some stuff, too. Finally (not really), in honor of my decision to stop this madness and kill off Stumpy’s Marathon, Ellen has agreed to look the other way as I celebrate the end of an era by laying out a terrific, finish line picnic spread in our back yard. Festivities begin when I finish and end when everyone leaves. The interim will be spent eating good food, drinking good beverages, admiring my pond with its new flagstone patio, and testing out the new fire pit. Naked dancing in the woods begins at midnight, after I go to bed. So, I am planning to give Stumpy’s a proper send off. Join me if you can. It will be something you can tell your grandchildren."